Hailey Friedman is the Product Marketing Manager at RealtyShares and the President of the San Francisco Bay Area Chapter of Badass Marketers and Founders, a highly curated Facebook group and community of over 15,000 professional marketers. The group was started by Josh Fechter, who handed it over to Hailey in mid-2017. Hailey started her career outside of the growth, advertising, and marketing industries as a participant for Teach for America at inner city schools in New York. Hailey eventually launched her own mobile app at SXSW and decided to pursue a career in marketing taking on a role at a mobile advertising startup. She moved to San Francisco in 2015 and joined RealtyShares as 2nd marketing hire and 20th employee. The total head count at RealtyShares is now over 120 and is continuing to grow. She also blogs about marketing on growthmarketingpro.com. Although acquiring customers at the lowest possible cost of customer acquisition is an obvious goal with digital advertising and other marketing channels, retention and what Hailey refers to as “activation” rate can be the make-or-break KPIs of growing a successful business. “For the first year I was there, that was definitely the focus – growth and doing so at the lowest acquisition cost possible. But what I’ve come to realize is that it’s not just all about acquisition. It’s a lot about retention. You can get customers to sign up for your product but at what rate are you getting them to pay for your product and nurturing customers through the customer journey? Instead of simply generating traffic, it’s essential to consider the churn, retention, and LTV across different segments of your users to see how much each acquisition is truly worth. There are, perhaps, thousands of marketing blogs, courses, podcasts, and other resources or training materials for advertisers and marketers learn new skills and stay on top of current trends. However, nothing replaces the value of speaking in person with other industry practitioners themselves. Hearing from fellow industry professionals in the formal setting of a fireside chat, or informally during a networking event can reveal top-of-mind insights that might not occur otherwise. It’s also, arguably, a faster way to acquire fresh information than your favorite blog or newsletter. Integrations are becoming increasingly important when setting up our marketing technology stack and syncing it with the rest of our analytics, sales, and acquisition toolkits. While many of the most popular technologies have native integrations with each other, it’s essential to find ways and workflows between the best-in-class products without direct integrations. Ander: This is very exciting today – especially today – because I’m sitting down with somebody who is featured in one of our case studies here at Instapage, at RealtyShares, and she’s also our new fearless leader of the Bay area Badass Marketers & Founders Facebook group. It was originally founded by Josh Fechter but now Hailey is taking his place. Hailey Friedman, so happy to have you here. Thank you so much for coming to our office. Hailey: Thank you. It’s exciting to be here. Ander: Is this your first podcast? Hailey: This is my first podcast! Ander: Awesome. Well, I hope it is the very, very first of many – your worldwide debut in the podcasting world is right here, right now! Ander: Now Hailey, you do growth at RealtyShares, you’re also our fearless leader on this Facebook group which, if you as a listener, if you’re not part of, I highly recommend you check it out at the end of this episode. And I introduced you a little bit in the introduction, said a little bit of who you are and what you do, but it’s obviously going to come much better from you. So, Hailey, who are you? What do you do? What’s the nutshell of how you got to be to where you are now? 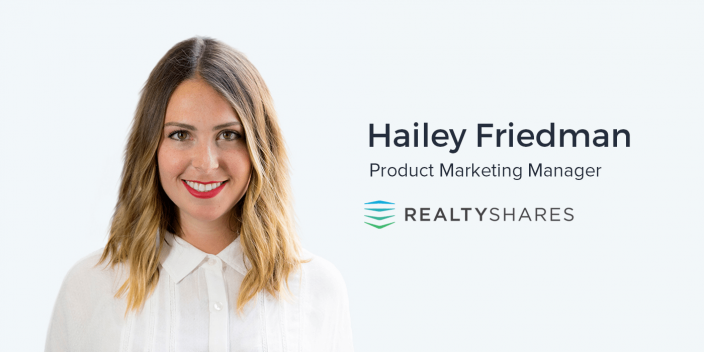 Hailey: Right now I’m doing growth marketing at RealtyShares and I’ve been there for a little over a year and a half. I joined RealtyShares as the 20th employee there and have watched the growth kind of skyrocket. I was the second marketing hire and now RealtyShares is a team of 120 people, so I’m learning and growing with the company. That’s kind of what I’m doing right now at work. I also recently took over as President of Badass Marketers & Founders, which is originally a Facebook group – like you said – that Josh started. Josh lived in San Francisco and twice a month he hosts events where he’ll do a fireside chat with an influencer in marketing or a founder of an awesome company. So now I’m kind of taking over in San Francisco, hosting a sub-group, a Facebook group that’s just for people who live in San Francisco, and also hosting these live events that’ll happen twice a month. Ander: And I think our CEO, Tyson Quick, is going to be with you for one of those. Hailey: Yeah! So Tyson’s actually our next guest. Ander: And by the time this publishes that may have already happened! Ander: But that’s totally ok. And Hailey, we have something in common in that we’re both marketers and we both do growth marketing here in the San Francisco Bay Area, but we have both a very unconventional background. I came from radio and you were a teacher previously at Teach for America! So, what did you do as a teacher? What was the beginning of your career and the beginning of your transformation into what you do now? Hailey: Yeah, so, when I was in school down at Emory University in Atlanta, I studied Psychology and Marketing so when I graduated I wasn’t ready to go into more Grad school for Psychology, which is kind of the next step there. Teach for America recruits really heavily at Emory, so I decided to join this program. It sounded like something awesome to do when I still didn’t really know exactly what I wanted to do yet, it’s for a good cause, I’d have a job right out of school. So I joined Teach for America and it was an incredibly challenging experience but also extremely rewarding. While I was teaching, I had an idea for a mobile app that I kind of took the initiative and put a team of people together across the country to build. Without going into too much detail about what the mobile app was, I’ll say that Snapchat just came out with a feature that very closely resembled the purpose of what the app was, which was kind of to see what your friends are up to on the weekends. Hailey: So that’s kind of the premise of the app. But while I was a teacher and I was in Grad school at night, I was working on building this mobile app. We ended up launching it on the app store. We ended up winning a start-up competition and getting flown down to South by Southwest. Hailey: Yeah, so that was my first experience being exposed to the tech startup world. I pitched this idea in front of hundreds of people and I just loved the energy of all the excited entrepreneurs. They’re wearing their t-shirts with their logo on them and sharing their ideas and I just decided that this is what I want to be a part of and this was really fun. Ander: When you saw the excitement on these people’s’ faces who were building companies, who were marketing companies, among others, was there something about that that reminded you of something related to teaching? Was there any overlap between the joy that you found as a teacher and this new thing that you found when you discovered marketing like this? Hailey: I think it’s just a matter of learning. I’m super passionate about learning new things and when I’m learning new things or meeting someone new or in a place I’ve never been or trying something I’ve never tried, it’s just when I’m at my happiest. Hailey: And I think, for me, the experience of learning what it takes to start a company was so new and exciting. Honestly, when you work at a startup that’s kind of how it always is, right? You’re always learning and you’re always iterating so I think it makes me so happy every day to be a part of that learning and growing process. And also I think teaching too, just being a part of that for other people, being an educator and helping other people learn and sharing that joy and those ‘aha’ moments for other people, I think that’s kind of the link. Ander: What’s interesting, especially with your new role with Badass Marketers & Founders, is you’re almost coming full circle in that you’re going to be helping a lot of people learn new things about our craft. Hailey: Yeah, that’s kind of why Mark Spera, who also works at RealtyShares, and I kind of started working on this little blog on the side – growthmarketingpro.com – and we’ve been kind of sharing our learnings as marketers. Ander: Awesome. I’m sure we’ll get more into that, but let’s take a step back to your story and to your journey out to San Francisco. You’re teaching in New York, you get excited about technology, and then what? Did you just drop everything to come out here and start working in the tech community? Hailey: Yeah, so I was teaching. I built this mobile app. My two-year commitment to Teach for America was up – and for those who don’t know what Teach for America is, it’s a two-year commitment to teach in an underprivileged school – so I was teaching 8th grade English in the Bronx at a charter school there. Around the same time that was up was around the same time that my app launched in the app store and it was also around the same time that my two software engineers that were working on it got recruited to work at Facebook and Microsoft, so they no longer were prioritizing this little side project. Hailey: Haha. Yeah. That was kind of the end of that which was a little sad but in the scheme of things, this was really just a stepping stone for what brought me to this whole tech startup world. At that point I realized that I had a lot to learn about what it takes to start a business from the ground up and that the best way to learn what it takes would probably be to join one at the ground level and hopefully near someone who had successfully done this before so I could really see what the process looks like. Hailey: So that’s what I did. I joined a startup in New York. It was a mobile advertising start-up and it was being led by the founders of a giant ad agency in New York. They had left that agency to join this mobile advertising startup and, at the time, mobile was really hot and brand new. No one was doing a good job advertising on mobile so this was kind of cutting edge for that moment. I was the second employee there and worked there for a couple of years. The vision I was sold on kind of changed, so originally I thought it would be a consumer-facing product and it ended up being more B2B so my role ultimately became a little bit more account management and sales oriented. And I was really interested more so in marketing to consumers. That and I always had side projects that I was working on and I was having a hard time finding people in New York that were passionate about the same things as I was that were as committed to working on a side project. I decided that I wanted to move to San Francisco and surround myself with people that are interested in talking about tech and ideas and start-ups and the same things that I was interested in. I wanted to be immersed in that world. Ander: And you discovered RealtyShares, took that job, and you’re still there now. Hailey: Yeah! So, I left my job in New York at that startup and decided I’m moving to San Francisco with or without a job. So I left the job in August and I decided October 1st I’m moving to San Francisco with or without a job. And I took those two months to have remote interviews. I think I had 45 phone and Skype interviews. Haha. Ander: Haha. Sounds pretty familiar. Hailey: Yeah. And actually, RealtyShares was the first one of all those. Hailey: Yeah, and it was the first offer that came across. I had a couple of other ones that I was considering. My main goal in moving was just that I wanted to do marketing, Business to Consumer marketing in San Francisco. That’s what I wanted so I decided to take the job at RealtyShares and I started a couple of days after I moved out to San Francisco and I’ve been there ever since. Ander: Awesome. Now, I imagine a lot of us want to hear about what you did at RealtyShares to make it what it is now. I’m going to recommend that all of you go check out the case study on our website. It features Hailey and features Mark as well, who is the Director of Marketing. But Hailey, there’s something I’m curious about – on a personal level, especially, because I experienced something sort of similar – when I came into marketing, I had all these preconceived notions about what it was and what it consisted of. And obviously, I’ve learned a lot over the time that I’ve been doing this. What were some of those misconceptions that you had when you started, compared to what you know now? Hailey: It’s actually really funny that you’re bringing this up because it’s really relevant. I think when most people think about growth marketing, they think about customer acquisition – and obviously, that’s important, right? So when I joined RealtyShares, I led almost all of the acquisition channels from SEM, SEO, podcasts, social, conferences, you name it. Ander: Everything under the sun. Hailey: All the various channels. And for the first year I was there, that was definitely the focus – growth and doing so at the lowest acquisition cost possible. But what I’ve come to realize is that it’s not just all about acquisition. It’s a lot about retention. You can get customers to sign up for your product but at what rate are you getting them to pay for your product and nurturing customers through the customer journey. And also the different touch points that you have with those customers and making those as smooth as possible so that you can get customers that are making purchases or, at RealtyShares investments, and doing so often. We call it ‘activation rate’. You acquire a number of customers, at what percent of those people are going on to make an investment and how many times are those people making an investment in a year? What is their repeat rate and how much are they investing? Thinking about the various things you need to do to get the most out of the customers that you’re acquiring. Ander: Gotcha. Do you remember the moment or period of time in which you really had this realization it’s not just about telling people about the brand or the company or the product, it’s about nurturing them and turning them into evangelists? Facilitating that loyalty. Do you remember when that all happened? Hailey: Yeah, I do. Haha. When you’re a start-up and you raise money and you want to grow, the directive is growth, right? Acquire customers. We have to do this faster than our competitors. We want to be big. And I think the VC sentiment in recent months is asking “well when are you going to be profitable? Let’s take a look at your unit economics.” How is this company going to make money? And if you’re thinking about it like that rather than just thinking about pure growth, then you really need to drill down and get the most out of the people that you’re acquiring. Ander: Right. What that really sounds like it comes down to is increasing the LTV of the people who are spending money with you. Hailey: Totally. I mean, as we’ve grown, my role has changed a lot. But in recent months, it’s shifted away from customer acquisition and more towards product marketing, making sure that our website experience for investors is as smooth and intuitive as possible. It’s also shifted more towards sales enablement and working with our investor services team and making sure that they have the materials and the automation that they need to make investor touch points as efficient as possible. Ander: What was one of the most important things that you’ve done – and presumably you’re continuing to do – throughout your whole career as a marketer so far? And moving forward, what is one of those things that has been completely indispensable to continuing to learn, to making sure that you’re staying ahead of the curve, and that you’re knowing what you need to know especially as you’re acquiring all this new knowledge? Hailey: Totally. Like I said, I love learning so I kind of take every opportunity I can to make sure I’m exposing myself to learning new things and especially about marketing. I think one of the best ways to educate yourself about marketing is to read, whether that’s reading books or listening to podcasts or reading blogs. I learned a lot from Mark, our Director of Marketing, but I’ve learned a ton by just reading blog posts of marketing gurus out there like Neil Patel. Even Josh has taught me a lot. I think reading and listening to podcasts is a great way to learn, and also networking, right? Talking to other marketers and asking what works and what doesn’t and learning from other people, attending marketing events or fireside chats like the ones that I’ll be hosting twice a month. Just talking to people and reading up. I think we’re in an interesting time where the way we educate ourselves is changing. I think that the type of marketing that we do, is so new and changing so rapidly that the only way to stay on top of it is to just keep educating yourself. Ander: And what type of marketing is that? Hailey: I think in terms of growth marketing, or even customer retention like we were saying, I think all types of marketing right now… it’s a changing world. I think the people that went to business school five to ten years ago and the philosophies and things that they learned, they’re all really relevant in terms of structure and understanding general principles I guess, but in terms of understanding what’s available today, every day I’m learning about new tools and things I could use. For example Instapage, right? It’s changed the way that companies are able to create post-click landing pages and you can do it faster than you ever were before and that’s completely changing the way that our marketing campaigns are operating. Ander: Well, thank you for the kind words. Haha. Hailey: Yeah, well, I got you! Ander: So one other thing that I’ve run into in the past – and I know a lot of other marketers run into as well – is there is so much excellent information out there, whether it’s blogs or podcasts or whatever else it is, that you can use to educate yourself about the changes in the industry, about things you maybe need to brush up on, or whatever it is. What is one way that we can get past the reading and the education and actually begin to execute on these ideas? I feel like paralysis by analysis – any way you want to phrase it – is something that a lot of us experience and I’m wondering if that’s something you’ve experienced and how you deal with it. Hailey: Yeah, that’s funny. Like I said, I always had little side projects that I’ve worked on so I think when I started to learn a lot about growth marketing while working at RealtyShares and through reading all these blog posts and everything, I acquired all this knowledge and I wanted to see what would happen. So I’ve helped my mom with her business, I’ve helped my brother with his business, making them a website, creating post-click landing pages for them, creating lead magnets for their content. I’ve kind of put all this knowledge into practice on little side things in helping other people and I think it’s been incredible to put that knowledge to use in that way. And then while I’m doing those side things, I’m actually learning more things that I go and bring back to RealtyShares. It’s a constant learning and iterating and implementing process. Let’s shift gears a bit and talk about what you’re going to be doing with Bay Area Badass Marketers & Founders. We are very lucky to have you leading this community. What it is now? 15,000 strong? I don’t know the exact numbers in the Bay area but there’s a lot of people who are really appreciative of the work that Josh has done. And, you’ve got some fairly big shoes to fill. I know that Josh will still be involved, but what can we look forward to? What are some of the things that you have up your sleeve? You don’t have to share all your secret sauce or anything like that but what are some of the differences that we might get to be excited about? Hailey: Yeah, Josh has obviously created some incredible content and shared awesome marketing tactics through this Facebook group and through these events. I think what will be different to some extent is the content, right? Now we’re at this point where we have the time and brain space to actually look back at what we did and what we’ve done in the past and be like, ‘Ok, well, how can we go and make this better? What kind of process can we put in place to save a lot of time here and there and make this work smoother?’ So I’m learning about taking start-up processes and making them great company processes, or larger company processes and it’s a learning experience for me and I think I’ll be able to share my findings. Ander: What I’m excited about with that is we’re all going to be learning alongside you, it sounds like. Hailey: Yeah, for sure. It’s cool. And I think I’ll be able to look back and be like, ‘Oh, well, now that I know this, I wish when I started working at this start-up, I wish as an entrepreneur I had known X,’ you know? Hailey: The other thing that I think will be pretty different between Josh and I is just that, you know, we’re different people. Josh just hosted some awesome events here in San Francisco and I’m looking to kind of bring my ‘Hailey vibes’ to those events. Ander: Funny you mention that. What are the ‘Hailey vibes’ that you’re going to be bringing to these events? Haha. Hailey: Haha. I’m really excited about bringing people to some cool new venues. Josh has hosted events at, I think, the NASDAQ Entrepreneurial Center and the Google Venture Labs which are all awesome. For example, I’m hosting my first event at a nightclub. Ander: Very fun! Is it going to be at nightclub hours? Hailey: No, it’s going to be from 6-8pm. It’s just going to be in a different environment. Hailey: And the second event I’m hosting is going to be on Pier 17 overlooking the Bay. So I’m kind of excited to bring people some new, interesting spaces. When I’m going to an event – like I said, I like going to new places and trying new things – so I think I’m going to try and spice it up and bring people to some new cool places in San Francisco and make it a little more social, a little more fun. Play some music, maybe there will be bars. Just make it more fun. Ander: Cool. So what do you think some of the challenges are going to be in this new leadership position that you’re in? And what is something or what are a few things that we as members of this group – or as marketers in general – what can we do to help you with that? Hailey: I think what’s going to be new about this whole experience is it’s going to be a lot of work. I think one of the things that’s going to be new about this whole experience for me is sharing so often, having a voice on social media in this group and sharing tactics and experiences. I’m used to going to conferences and sharing my learnings back with my team at RealtyShares, but I’ll kind of sharing my learnings with the world more often. Ander: Well, we’re excited to hear those learnings most definitely. And I think one of those learnings that maybe you can share with us right now is your perspective on the future of marketing and the future of growth marketing. Where do you think this space is headed as a whole and, most importantly, what can we as marketers do to stay up-to-date, to be prepared for that space in addition to reading, of course? Hailey: Yeah, so the future of marketing… Marketing is moving at such a rapid pace. There are tools out there that I’m learning about every single day that automate and optimize your channels in brand new ways. And I think there are a lot of different tools popping up here and there like Chrome extensions or WordPress plug-ins or things that are helping marketers in the work that they do and they’re all very scattered. You might learn about one and not hear about another until later on. I think one way that marketing might move in the future is companies might try and collect these little tools and package them. Ander: Interesting. So you’re saying some consolidation of services? Is that one way to look at it? Hailey: Yeah, I think companies will go out there and collect all these little tools and kind of consolidate them and package them in a way that’s more useable for marketers. Ander: Do you think that some of that is because of commoditization? Are some of these tools so available in so many other places that it’s kind of required that marketing technology companies include them in their suite of tools? Hailey: Yeah, I think on a daily basis I probably have forty to fifty tools open on my computer as a marketer. It is crazy. You have to be able to go back and forth between tools. Some of them integrate; some of them don’t. You can use tools like Zapier to connect them. There’s so many places where our data exists and I think the future of marketing is figuring out how to take all these tools and consolidate them and connect them in a way that marketers can use them more easily. Ander: Awesome. Well Hailey, it has been a pleasure having you here. Thank you so much for coming to our office. I know you have a very busy schedule so it means a lot that you took time out of your day to spend the past thirty minutes or so here with us. If people want to reach out to you and follow what you’re doing, or if they want to follow RealtyShares, how can they do those things? Hailey: Well, they should definitely check out RealtyShares. If they are interested in what I’m doing, I blog about it at growthmarketingpro.com. They should also connect with me on LinkedIn. I’m sharing a lot of my experiences there as well. Hailey: And they should check out the Badass Marketers & Founders Facebook group – if you are in San Francisco, you should join the San Francisco-specific sub-group and if not, join the main one. Ander: Awesome. Well Hailey, once again, thanks so much for coming in and I’m sure we’ll talk to you soon. Hailey: It was so great being here. Thanks for having me, Ander.